At the 2015 international climate summit in Paris, Parties to the UN Framework Convention on Climate Change (UNFCCC) agreed to design and adopt the rules and procedures that will guide countries in meeting their obligations under the Paris Agreement on climate change. As the past two years have shown, negotiating fair and robust implementation guidelines remains a difficult task, as countries navigate complex technical options and vastly different political interests. One important element is the transparency framework, which includes concrete obligations for Parties to evaluate their mitigation efforts, including a requirement that countries do more to communicate successes, make it easier to identify their needs, help channel support, and reveal where further effort is needed. The review process under transparency framework lends credibility to Parties’ actions and constitute an important tool to help them make better evidence-based decisions for more robust climate action. The Project for Advancing Climate Transparency (PACT) provides research, analysis and creative thinking to encourage the design of an effective international transparency system to support the Paris Agreement. Through this project, WRI and its partners are releasing two complementary papers on two core aspects of the transparency framework: reporting and review under the Paris Agreement. These two papers draw on 20 years of experiences within and outside the UNFCCC, and consider the purposes and benefits, both internationally and domestically, for enhanced reporting and review practices. They also examine whether existing modalities, procedures and guidelines (MPGs) should be maintained, adjusted or eliminated, and whether new elements and approaches should be considered in order to provide guidance for the negotiations in Bonn. Why Do We Need an Enhanced Transparency Framework? Many aspects of the existing transparency regime have worked well, and the enhanced transparency framework should build on them. However, the current regime is hampered by inefficiencies, delays and incomplete information, which could be exacerbated with the expected increase in the number and frequency of reporting and reviews under the Paris Agreement. Ultimately building confidence and fostering cooperation among countries and wider stakeholder groups. How Should the Transparency Framework Be Enhanced to Support the Goals of the Paris Agreement? The reporting requirements under the transparency framework should be designed as part of a package, aligned and complementary to other communication and accounting processes under the UNFCCC. The papers identify the minimum set of reporting requirements necessary to track progress in national climate mitigation targets and identify how to move toward best practices. This includes the inclusion of more useful information to understand where we are, where we need to be and how we get there so as to inform the global stocktake required every five years under the Agreement and encourage more ambitious actions. While the scope of reporting and review will be prescribed by the Agreement, its robustness and depth should be relevant in both the domestic and international context. Countries wishing to broaden the scope of their reporting or review could ask to do so. The reporting and review guidelines could be made clearer to promote more consistent and comparable approaches. In some instances, additional methodological guidance would be required (for example, monitoring and evaluation of adaptation efforts, estimation of the impacts of policies and measures, and tracking of financial flows). 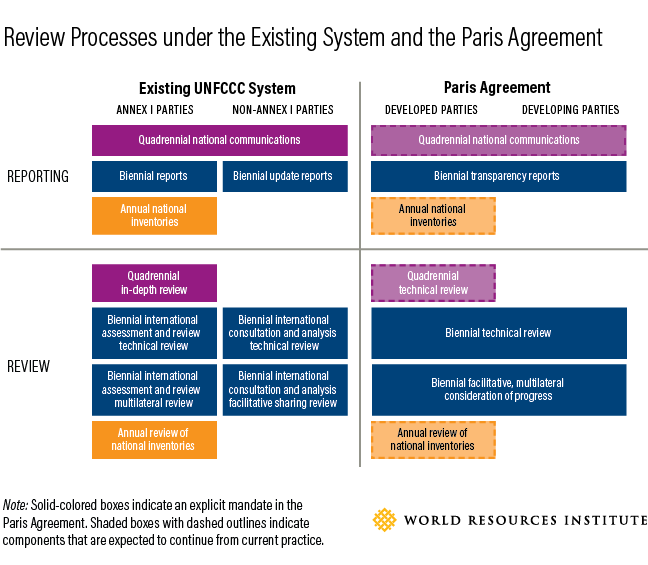 The type and intensity of the review process (should be selected based on established criteria (such as the quality of previous reports, emissions threshold, level of financial resources available for each review cycle, type of NDCs). Timing is critical for reporting and review to make the transparency framework more effective and sustainable. Sticking to clear timetable for the production of reports and for the organization of the review process itself, could result in more relevant and timely information for the national decision-making process, the global stocktake, and the mechanisms to facilitate implementation and promote compliance. The review process could be further streamlined and generate improvement plans, based on expert advice on how to address any gaps and needs, in order to sustain a virtuous cycle of improvement. The reporting and review process could be made more inclusive and participatory and incorporate the role of subnational and non-state actors into review and reporting. For instance, governments could be encouraged to nominate and train more experts from nongovernmental organizations to serve in their personal capacity on the technical expert review team. Such mobilization of non-state actors could ultimately strengthen their contribution to the implementation of climate actions. How Will the Enhanced Transparency Framework Be Addressed at COP23? On Reporting: Pursue the Paris Agreement principles of transparency, accuracy, completeness, consistency and comparability, which can increase the burden on Parties if greater quality and quantity of reported data is required. On the other hand, more flexible reporting requirements can reduce the level of comparability and the ability to understand overall collective progress. On Review: Prepare in-country reviews that are the most thorough and offer the best opportunities to build capacity but are also the most resource-intensive. Flexibility on the type of the review could be guided by some criteria to reduce the burden on the Secretariat and Parties, while making sure they are the most appropriate to build up capacity and improvements in given circumstances. Parties will also pay close attention to the way flexibility is provided to those countries that need it, how existing practices can be adjusted to be fit for the purpose of a more ambitious Agreement, and how capacity building can incentivize enhanced transparency and be sustainable. It will therefore be important during COP23 and beyond for countries to keep in mind the end goal, the benefits and value of reporting and review, and to spend enough time discussing the vast array of issues to make the transparency framework more participatory, more effective and more supportive of the ambition we need to achieve to make the Paris Agreement a reality.